An interesting article suggesting methods of looking for extraterrestrials who might have arrived right in our neighborhood has been placed on line by astronomer Gregory Matloff, Adj. Professor of Physics and Astronomy at NYU. One of the suggestions is that ETs might have arrived in normal space using laser-powered light sails. This method was suggested by Robert L. Forward, who published a short paper Ground-Based Lasers For Propulsion In Space in 1961. 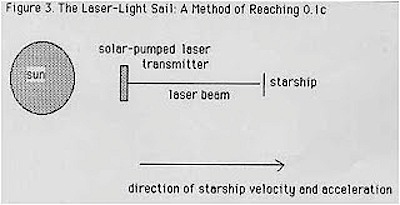 For decades or century duration interstellar voyages at speeds as high as 10% of the speed of light (0.1c), a favored propulsion system is the laser light sail. A solar-pumped laser power station is constructed in space and maneuvered into position between the Sun and the destination star. A laser beam from the power station impinges against the light sail of the starship – a highly reflective metal sheet with a thickness of nanometers or microns (Figure [below]). The pressure of the laser photons accelerates the spacecraft in the direction of the destination target star. Optimum performance seems limited because of the requirement for the power station to be “suspended” between Sun and starship very accurately for decades, but projection instead of both power station and probe on the same initial slow hyperbolic trajectory towards the target star may somewhat alleviate pointing problems. Dr. Matloff does not give any hints on how we might have been able to see the light-sail craft propelled toward us. However, in their 1974 classic The Mote in God's Eye, sf writers Larry Niven and Jerry Pournelle give a description of how a space craft powered by laser cannon might look - a century before its arrival in the targeted system. From this one system, the Coalsack dark nebula (which is a real celestial object) looks like a hooded figure in profile, with a tiny star in the position of the eye. Renner asked "How did the [Church of Him] get started?" "Legend has it," Potter said and stopped. "Aye it may not all be legend. What the Himmists say is that one day the Face of God awoke... He opened His single Eye." That would figure, if the Moties were actually using laser cannon to propel a light sail..."
Be sure to read The Re-Enchantment of the Solar System: A Proposed Search for Local ET’s, via Next Big Future.